Why should you choose Red Creek Apparel and Promotions? Samples – We deliver or drop ship. R ed Creek Apparel and Promotions strives to provide excellent customer service by paying attention to detail and working with each customer to help them find the right items for their project. We make sure your order is done correctly and in a timely manner to provide the quality products you expect. W e have an extensive inventory of apparel and promotional items that you can choose from and we customize the items with your logo. Our logo application process includes embroidery, screen printing, and digital printing. The choice of application depends on the product chosen and we work with you to help chose the best option. W e have several catalogs available on our website for you to look through for apparel and promotional items. We source products from many more companies not shown and can offer numerous choices. Contact us today and we can work with you to find the best product for your project. W e have been in business for over 25 years, our knowledge of screen printing, embroidery, digital printing, and branding is extensive. We will work with you to help find the best product and logo application process for your project or special event. W e are a local company and we believe in supporting our local community and businesses. We work with businesses large and small, organizations, and groups to help them with their projects. The Washington State Senior Citizens’ Lobby, over the last two years, has purchased several large orders of the Grocery Tote Bag for our yearly Fall Conferences held in Tacoma at the Hotel Murano and for the Senior Lobby Day held each year in February during the Washington State Legislative Session. We are very happy with the product. It is very well made, attractive, and it is made with long straps so it can be used over the shoulder. In addition, the customer can have images of your choice printed on the Tote Bag. We love them and received numerous compliments by the attendees at these functions!. Not only does Red Creek do quality work for embroidery and other printing, but they are customer service driven. The Capital CIty Marathon Association’s priority is using local businesses, and Red Creek has made that an easy goal to meet. Rebecca and Dennis are wonderful to work with – I know we are well taken care of when we work with them. They go the extra mile. 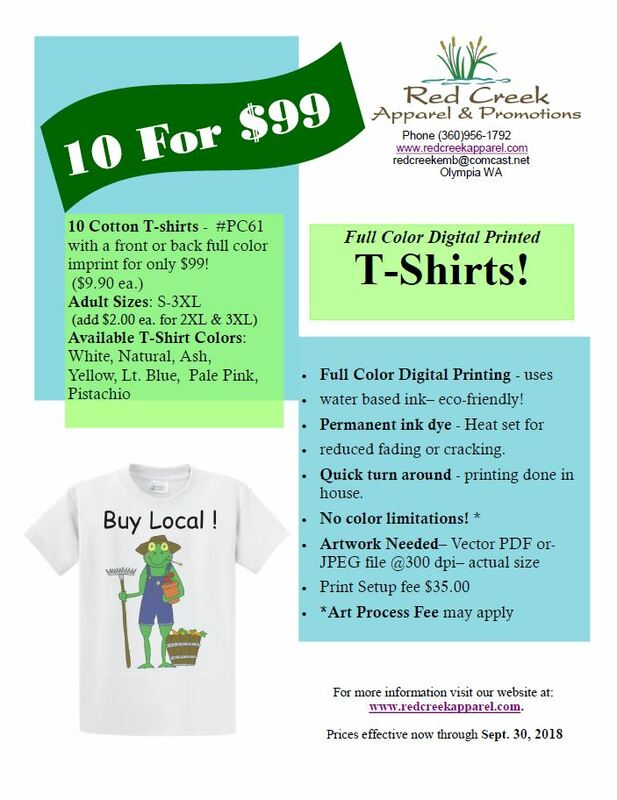 We have been customers of Red Creek Apparel for more than 10 years. Their service is wonderful. Their products are beautiful. They have been able to meet our deadlines, which admittedly are sometimes short. And, when I’m stumped for ideas, they always come up with just the right item to fit our budget. It has been a great partnership over the years. Join our E-mail List to receive our notices of new products and preferred customer specials!